A man has died after being dragged under the wheels of a bendy bus for more than a mile in east London. Lee Beckwith, 21, of Brentwood, Essex, was trapped beneath the number 25 bus after getting off in Ilford High Road at about 0500 BST on Tuesday. 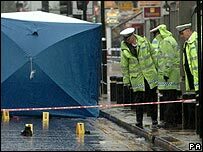 Emergency crews were called to Romford Road about 15 minutes later when a passer-by spotted Mr Beckwith's body. The driver of the bus has been arrested and the bus, operated by East London Buses, will be examined. Mr Beckwith is believed to have got off the bus with a friend. "It appears at this early stage that the male then fell and became trapped beneath the wheels of the bus," said a police spokesman. "The body was dislodged after approximately a mile in Romford Road, just past the junction with Rabbits Road." Motorists were advised to avoid the area as roads were closed to allow forensic examinations to take place. Mr Beckwith's death has prompted calls for a review into the safety of bendy buses. Liberal Democrat MP, Susan Kramer, said: "The great fear with bendy buses is that are they safe in the way we know other buses are in London. "It seems to me we have to say it's about time for a review of bendy buses". But a Transport for London spokesperson said the London bus network has an excellent safety record. "Fatalities are extremely rare - one fatality for every 100 million miles operated," she said.